If Winnie-the-Pooh’s creator is right, the world has got a lot of decent fellows in it. Potatoes are so well liked that Ore-Ida, the frozen french fry maker, successfully developed a nation’s appetite for the scraps of potatoes left over from cutting their fries. In 1954, Ore-Ida chopped up their bits of potato, mixed them with flour and “some other things”, and formed them into little cylinders. The Tater Tot was invented…and made its public debut in Miami Beach, served up to the National Potato Convention for breakfast. 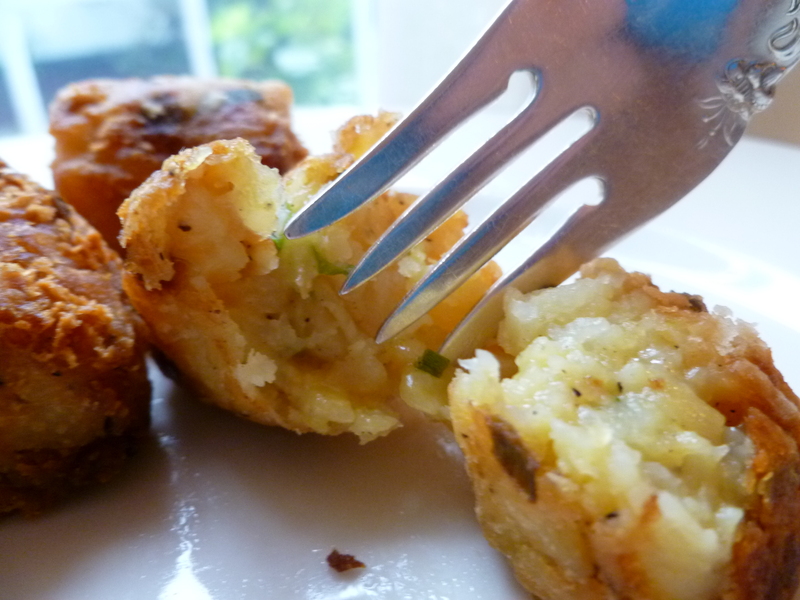 Potato Croquettes are transformed Tater Tots. Made with fresh potatoes, the addition of Cheddar cheese, and the deletion of the “other things” in the processed variety, the little Tater Tot moves from Napoleon Dynamite’s lunch tray in the school cafeteria to dinner china. oil for frying the croquettes (enough to fill a heavy skillet or pot to a depth of 1 and 1/2 or 2 inches: Peanut oil is fine, but any other oil you are accustomed to use for frying will do as well. 3. 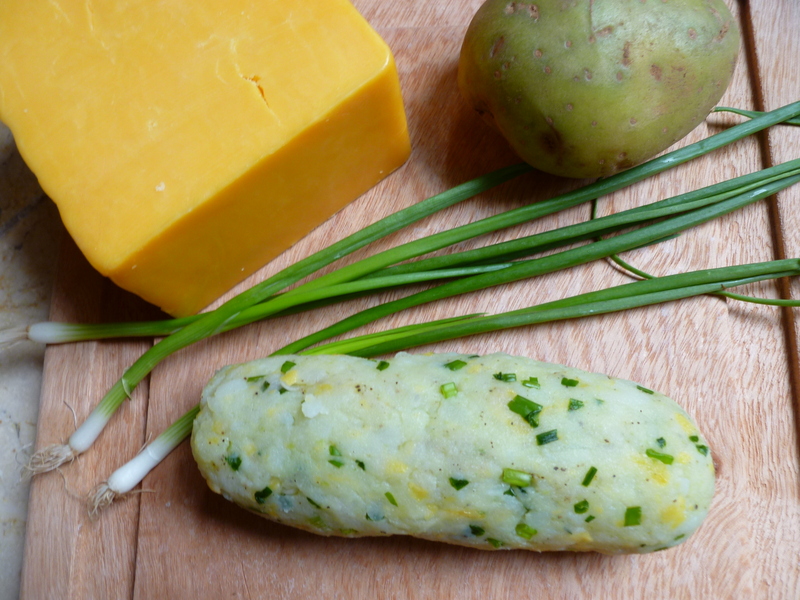 In a bowl, mix the grated potatoes, the green onions, cheese, salt and pepper. 4. Form 3 or 4 cylindrical rolls with the mixture, wrap them in waxed paper or plastic wrap and refrigerate them for an hour. 5. Fill a deep, heavy skillet or heavy pot with oil to a depth of about 1 and 1/2 or 2 inches. 6. Cut the rolls into smaller cylinders. The ones in the photos are about 1 inch long, but there is no reason to conform to that measure. Put some flour on a plate and, when the oil is hot, roll the croquettes in the flour and fry them a few at a time. Turn them as they fry to brown them evenly. Drain them. The croquettes can be made ahead of time and reheated at 400 F. for a few minutes. 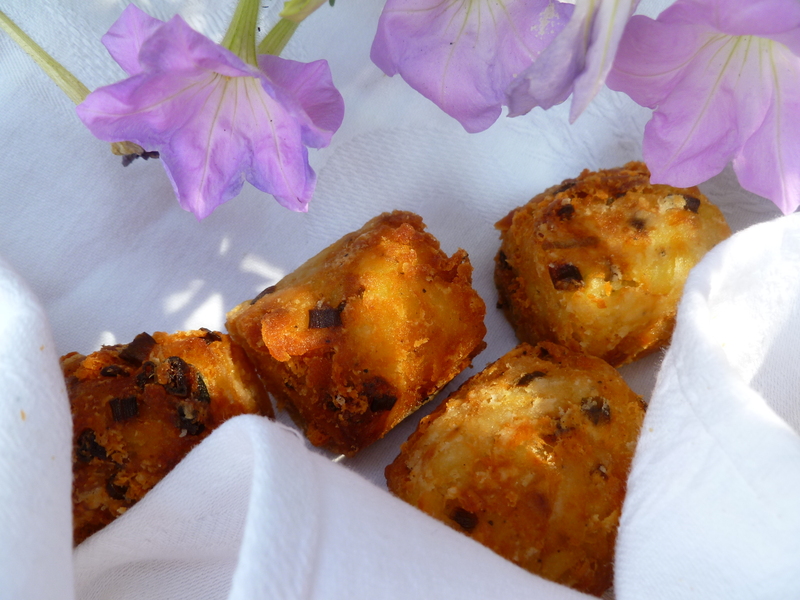 A Note: The Dinner Menu: Dinner at Summer’s End includes Potato Croquettes. The recipe was adapted from one at grouprecipes.com.